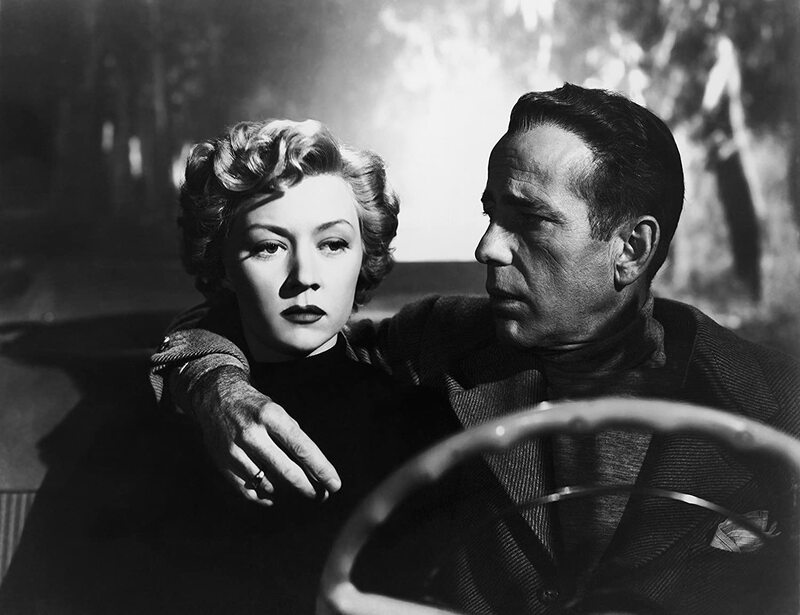 In a Lonely Place (Criterion, Blu-ray, DVD) hasn’t much to do with the Dorothy B. Hughes novel on which it was ostensibly based, beyond the title (one of the most evocative in noir history), the Los Angeles setting, and the murder of a young woman that puts our ostensible hero, volatile, hard-drinking Hollywood screenwriter Dixon Steele (Humphrey Bogart), in the crosshairs of the police. The victim, a bubbly, not-too-bright hat check girl, had been to Dixon’s apartment to recount the story of a romantic potboiler bestseller he’s too jaded to read himself. When he’s hauled in for questioning, he’s unfazed and sardonic, treating the whole thing like a murder mystery plot to be dissected. The oddly-named Detective Sergeant Brub Nicolai (Frank Lovejoy) tells his boss that Dix has been like that ever since they met in the war, where his hard, cynical attitude kept the unit alive, but the Captain isn’t convinced. Even when he’s alibied by his lovely new neighbor Laurel (Gloria Grahame), a one-time Hollywood starlet running from a failed romance with the poise of a queen of society. She likes his face. He likes her style. I like their flirtation: smart, knowing banter, seductive smiles, a push-and-pull as Laurel decides whether she’s ready to jump into another relationship. Despite that poise, she’s a little skittish about commitment. Dixon is a classic literary type—the hard-drinking, hot-tempered, scrappy artist who turns down assignments beneath his dignity, insults the industry players who hire him, and gets into bar fights at the slightest provocation—with a darker soul than we usually see in such characters. “I was born when she kissed me. I died when she left me. I lived a few weeks while she loved me,” he tells Laurel, a line he wants to put into his screenplay but is surely inspired by his happiness with Laurel. It’s lovely and yet it predicts the inevitable doom of their romance. There’s a bitterness under his cynical banter and an anger that fuels flashes of jealousy or betrayal into vicious, violent responses. Laurel sees it play out with strangers and it starts to scare her, especially as the investigation into the murder (which is otherwise swept to the sidelines of the story) keeps circling back to Dix. I don’t usually compare movie adaptations to the original novels—apart from bestsellers and literary classics, Hollywood tended to treat the books and stories it purchased as raw material to be reworked for the needs of the moment—and I don’t intend to here, but I love the way the film itself comments upon the process. Dix rewrites the novel in his latest assignment, inspired by the romance that blooms with Laurel, just as Andrew Solt’s screenplay rewrote the novel and his script was subsequently rewritten by director Nicholas Ray to reflect his unraveling marriage to Grahame, who he cast after Bogie’s first choices were unavailable. It would have been a great role for Lauren Bacall and Grahame delivers Bacall’s confidence and command and model’s poise, but she also has a dreamy vulnerability that is uniquely her own. It’s one of her best performances and Ray shows off a glamour and grace she didn’t get in other roles as well as a smart, powerful performance. Bogie himself had a reputation for drinking and bar scraps and he’s clearly all in on the rewrite; he developed and produced the film through his own Santana Productions. Bogart has played hard-edged characters and violent anti-heroes before but none are as damaged and dark and out of control as Dixon. The romance comes off the two-fisted tough-guy literary hero in this portrait. This is film noir without guns and gangsters, with no robberies or blackmail schemes, where the only crime on screen is a couple of alcohol-fueled assaults (one of which veers close to manslaughter, admittedly, but doesn’t cross the line), and yet it is among the most devastating you’ll ever see. The murder mystery no more than a backdrop to the ambiguous study of love torn apart from within. Features commentary by film scholar Dana Polan, a new interview with Gloria Grahame biographer Vincent Curcio, a 20-minute piece with filmmaker Curtis Hanson produced for the 2002 DVD release, a condensed version of the 1975 documentary I’m a Stranger Here Myself (this runs about 40 minutes), and the radio adaptation of the original novel produced for “Suspense” in 1948, plus a fold-out booklet with an essay by Imogen Sara Smith. You can read Smith’s essay here.